This isn’t my normal blogging topic but my life has been changed so dramatically by it I felt the need to share it with you incase anyone else is in a similar place. As long as I can remember I have struggled with stomach pain-even as a child. Over the years I’ve seen numerous doctors who have just told me I have IBS and given me prescriptions that never seemed to help. I had resigned myself to living with IBS and the pain and discomfort that came along with it. Recently I came across some new research about IBS that has totally rocked my world. Monash University in Australia discovered that certain types of carbohydrates-called FODMAPs (Fermentable Oligo-saccharides, Di-saccharides, Mono-saccharides And Polyols)-cause symptoms in people with IBS or inflammatory Bowel Disease. To find out if FODMAPs are the cause of your symptoms it’s suggested to go on a FODMAP elimination diet under the guidance of a dietician and then slowly reintroduce the different types of carbohydrates in until you find out which bother you can your personal tolerance levels. I didn’t choose to go on a total elimination diet, instead I kept a food diary and tried to limit high FODMAP foods (there is a very helpful app to tell you which foods to avoid in the Apple app store or you can find a list here.) Through trial and error I found that I have about ZERO tolerance for frustose-so nothing with high fructose corn syrup, apples, watermelon, etc. In fact-remember how I told you I’d get sick after eating salmon? It turns out that the frozen salmon I was buying had fructose as an ingredient-who would’ve thought? Most of the other FODMAPs I can have as long as I limit them-too many in one day will set me back with my symptoms. I also realized that cellulose used in preshredded cheese bothers me immensely-so I have to shred my own cheese! 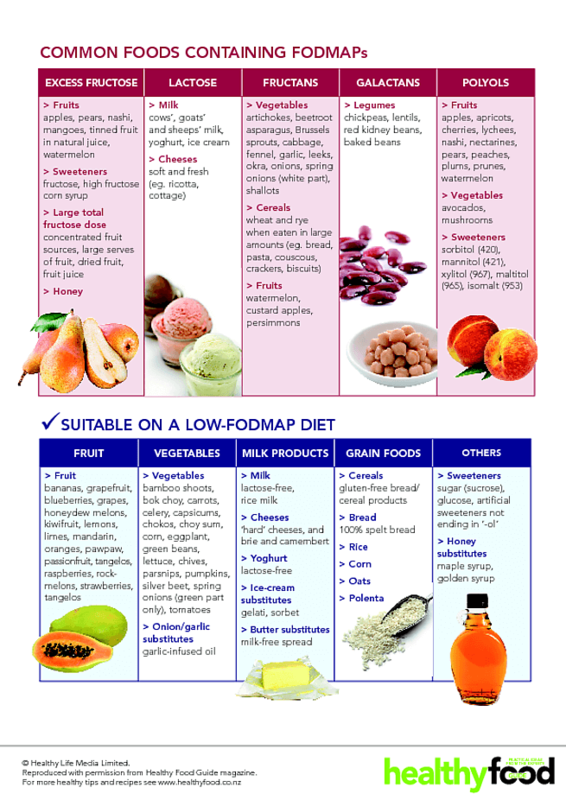 There are a ton of online resources to learn more about FODMAPs, this blog has been particularly helpful to me. If you choose to try to eliminate FODMAPs completely I recommend finding a dietician who is familiar with FODMAP research to guide you as you could eliminate them to the point of nutritional deficiencies. The research is on the newer side so be sure to ask your dietician or nutritionist if they are familiar with it before choosing one. As I said before, I know this is “off” of my usual blogging subjects but as this blog gives me a platform to reach others and this made such and enormous difference in my day to day life I wanted to share with you what I’ve learned in hopes that it can help others get on the path to feeling better as well. I too struggled with IBS-type issues throughout the years. Sometimes they were worse than others, but boy can I relate to your description of just not eating much because it hurt so bad. 🙁 I researched & tried different whole food type diet plans, but didn’t see the level of results that most people claimed. Sometimes certain foods would trigger immediate symptoms, but other times those same food would be fine. I was so confused trying to keep track of what was causing this pain & I was miserable! I stumbled upon an article about salicylate sensitivity/intolerance & Hallelujah, it finally made sense! It wasn’t a particular kind of food that causing the problems, it was many! (sounds a lot like your FODMOP) Once I reached my tolerance level, the symptoms would start. I suggest at least looking into the topic; salicylates and IBS are closely related in many cases. I’ll look into that…I’ve found that I can’t do foods with cellulose either-like I can shred my own cheese just fine but if I use pre-shredded where they use cellulose to keep it from sticking together I’m miserable for days. Who knew? ?